Christianity's most controversial doctrine put under fire! - Why did He fail to mention hell in Genesis as the price for sin? - Why doesn't the Old Testament ever teach about or even mention hell? - Why does Paul, the apostle to the non-Jewish world, never once mention hell? - Why was hell not the orthodox position of the early Church for five centuries after Christ? - Why can the most studious theologians not agree if we are saved by election or free will? Dare to question. What have you got to lose? If you’ve ever had doubts or questions about the incompatibility of eternal torment with a merciful God, Raising Hell will open your eyes to a radical view of God’s loving purpose for all humanity and what the “Good News” is really about. 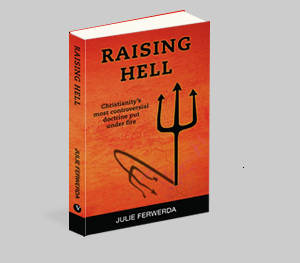 Picking up where Rob Bell and others leave off, Julie Ferwerda offers compelling evidence historically, philosophically, and scripturally as to why the doctrine of eternal torment is the biggest and most damaging deception of the modern Church. "Raising Hell is one of the first books I recommend to anyone who has questions about hell." Kevin Miller, Director of "Hellbound? The Movie"
Julie Ferwerda is recognized for teaching Scriptures with compelling simplicity, making them relevant and exciting for all ages. She has authored several inspirational books and hundreds of articles, encouraging people along their faith journey. "Just finished the book. Loved it. Thank you for all of the time and research that you put into it. Love Wins was more about asking great questions, your book is about great answers." —Tyler B. For bulk orders of 10 or more books, please view the Bulk Order section. To qualify for the special bulk order discount, you must order 10 or more books. The cost of each book is $5.00. There is a $1.00 per book shipping surcharge for U.S. orders. Once you click the Purchase Now button, you'll be transferred to PayPal where you can pay either with a credit card or with a PayPal account. Should you have any other questions, please use our contact form. Thanks for helping to promote Raising Hell! For Canada and international orders, please Contact Us and specify the number of copies you'd like to order, for a cost estimate that includes shipping.